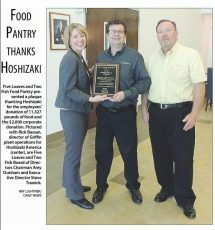 HOSHIZAKI Delivers Large Donation to Local Food Pantry - Hoshizaki America, Inc.
Griffin, GA (December 13, 2017) – Employees of Hoshizaki America, Inc. donated 11,327 pounds of food to the Five Loaves and Two Fish Food Pantry. The 220 employees in the Griffin Hoshizaki facility collected the food throughout November. 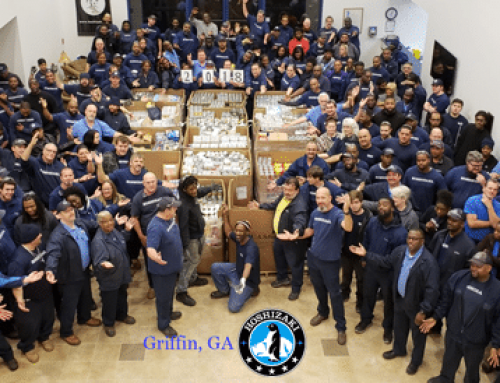 “We donated 7,000 pounds last year and we wanted to escalate our efforts and go above and beyond this year,” said Director of Griffin Plant Operations Rick Bassan. Hoshazaki also donated $2,000 to the food pantry. 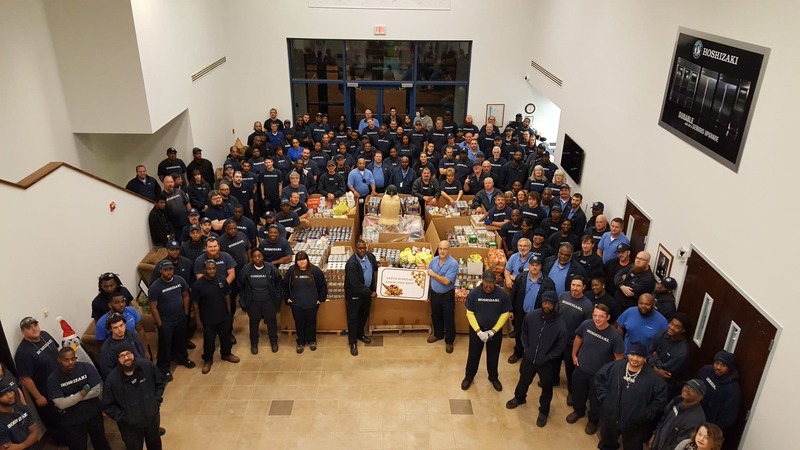 A group of Hoshizaki employees came to help unload the food and were taken on a tour of the pantry operation by Executive Director Steve Traywick. Five Loaves and Two Fish Food Pantry is the fourth-largest food pantry in the state due to the amount it distributes to families throughout the year. 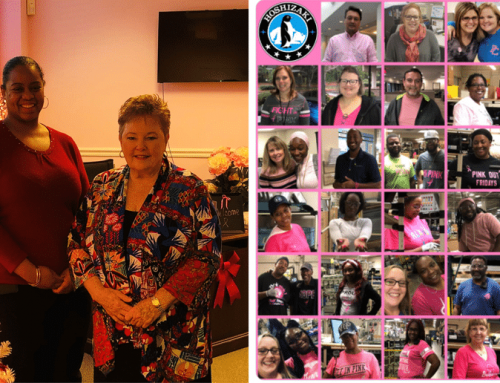 Spalding County receives the most with 86 percent going to local families and the rest going to families in surrounding counties. He also noted that the items need to be in date. The pantry can give out items up to one year from the date stamped on the item. Items that are needed but rarely donated are diapers, small personal containers of hygiene items, feminine hygiene products, and small reusable bags. 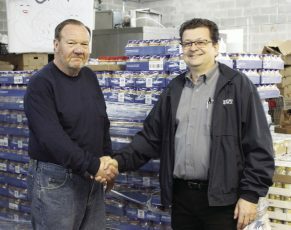 A large item on their wish list is portable lift system needed to lift the pallets of food up to floor level to unload. Another wish list item Traywick noted was the need for a printer. A Hoshizaki employee said he had one and would gladly donate it. The community can help Five Loaves and Two Fish by donating money and items as well as volunteering time. Many volunteers are overseen by Martha Richards, food pantry warehouse manager. “She is the key to making the whole operation successful,” says Traywick. For more information on Five Loaves and Two Fish Food Pantry, call 678-603-1238. 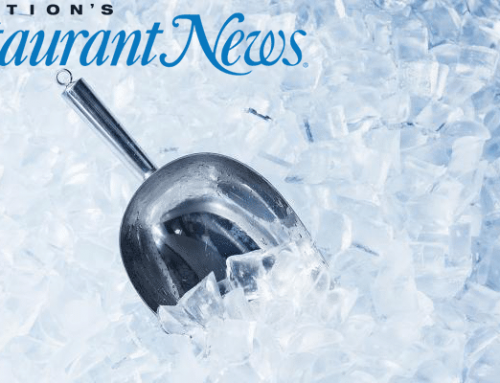 The pantry is at 412 West Slaton Ave., Griffin, GA 30223 and the hours are Mondays and Wednesdays from 2 to 4 p.m.; Tuesdays and Thursdays from 10 a.m. to 12 p.m.; and 5 to 6 p.m.; and on Saturdays from 10 a.m. to 12 p.m.